Lekin, sab badhiya hai ji. The Modi Government in the center is in a habit of giving surprises to citizens. And these surprises are not pleasing ones. Most of them have been shocking surprises. The list begins from “DEMONETISATION”, “GST” etc. . The most recent addition to the list is "FUEL PRICE HIKE". India's civilians (INDIANS) have tried their level best to adapt to these shocking surprises of BJP Government. Somehow, they are managing their living. After experimenting with Demonetization, Honorable PM of India thought that I am not visible on TV as I used to be. To garner some more headlines in the newspapers and TV channels, PM Modi planned another surprise for us. 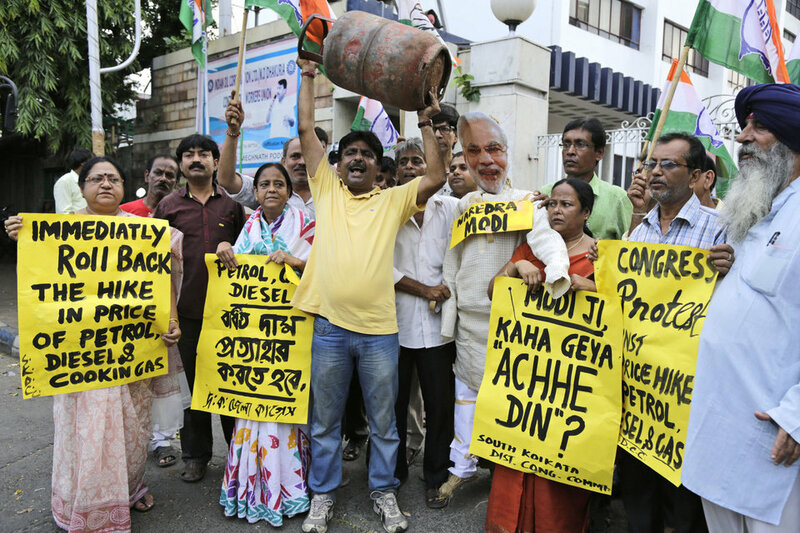 The recent surprise by BJP government was “Fuel price hike”. Petrol and diesel prices shot up fortnight. The fuel prices became exceedingly high and troubled every city in the country. Ironically, this is the same BJP Government, which berated the Congress Govt when they were in power, on “Fuel Hike”. At that time, BJP came on to the streets to protest against the rise. That was what they did when they were in the opposition. Now, coming back. BJP is in power. The BJP leaders have occupied a comfortable place in the Cabinet, just like PM Modi. They are going on justifying the “Fuel price hike” by flawed logic. But there's some humanity alive. A BJP spokesperson on ET said, “The Modi govt is sensitive to agonies of people.” If it were so, what was the reason to come up with fuel price hike? The Centre imposed an excise duty of Rs 2.5 on fuel and further advice State Govt to levy VAT of Rs 2.5 on the price. The states ruled by BJP followed their “FAKIR” Command. However other party led govt didn't agree to the VAT. AAP led Delhi government didn't raise the prices from their end and consequently, the petrol and diesel prices were cheaper in Delhi as compared to other Metropolitan cities of India. The most expensive fuel prices were in Maharashtra, and the Mumbaikars had to pay highest in response to the fuel price rise. With total tax (Excise+VAT) of Rs 5, the net rise in fuel was Rs 4. Remaining Rs 1 burden was borne by the dealers. People who voted Mr. Modi in hope of "Acche Din" must be happy now. There are so many surprises every day. The BJP government won’t let you keep any money. After all, the MONEY is about MOH-MAYA. FYI, almost half of fuel price is made up of TAXES. 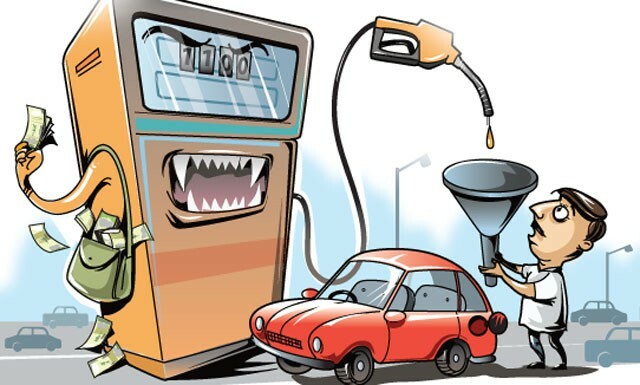 Prior to the fuel price hike, the center levied excise duty of Rs 19.48/l on Petrol and Rs 15.33/l on Diesel, besides the VAT (now SGST) that you pay. SGST is decided by the State government. The base price is very less, but these taxes make it exceedingly high. After widespread resentment in public on Rs 5 price hike, the center revised the excise duty tax. After revision, the consumers had to pay Rs 20.98 for petrol and Rs 16.83 for diesel as excise duty. Yet, it was not acceptable for the common man. The twitter reactions on Fuel price were worthy of consideration. Kurt Morris tweeted in a satirical way, "Fuel price hikes, takes us back to the Stone Age with the Flintstones." After accumulating enough money from excise duty, the central Govt choose to withdraw its excise of Rs 2.5 during the last days of the first week of October. Thus, providing a bit of relief to citizens. The central govt again advised the State govt to roll back VAT. The Maharastra govt followed orders, and fuel prices were restored back. All BJP led governments in the country did the same. And he has a valid point. (Kerela is in good hands. I mean, literate hands!) A rise in excise of Rs 14 and Rs 9 can’t be taken lightly. It is a testimony of BJP govt's sensitivity towards the well being of common man. I am waiting for the day, when BJP led center will force, everyone, to ride the bicycle and reach office in 2 hours, instead of 15 minutes. And I believe it is not far! Air is travelling in them for free. 10 Types Of Political Ideologies That People Live With - Who are you? You can’t endure their suffering.